There’s nothing like a tall refreshing glass of OJ in the morning – except for this outrageously orange smoothie. This is the perfect smoothie for orange lovers with its sweet and tangy taste. Oranges are renowned for their vitamin C content, but what other nutritional benefits do they offer? They contain a variety of phytonutrients, which when combined with vitamin C provide significant antioxidant protection and immune system support. The phytonutrients found in oranges have been shown to lower high blood pressure and cholesterol in animal studies. Oranges also contain a good amount of folate, vitamin B1, potassium, vitamin A, and dietary fiber. Folate and potassium offer protection against cardiovascular disease. A diet high in citrus fruit helps protect against some types of cancer, and citric acid prevents both kidney stones and ulcers, which are good to avoid. 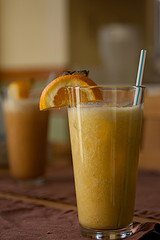 Now that you know how oranges promote optimal health, let’s get to the fun part, making an orange smoothie. Place the ingredients into your blender and blend on high until desired consistency is reached. I would love to know if you try this outrageously orange smoothie – please leave a comment below. Happy Blending! Tried it this morning with just one large navel orange. Delicious!! I just made this and am sipping on it right now. It’s so delicious! :) My husband says it tastes like sherbet. Thanks for the fantastic recipe! I will definitely make this again!